I read Dan Warner's article on Bishop Dewane, “Undeterred by dust-ups, Bishop Frank Dewane focuses on flock,” Dec. 13, with great interest as I am a priest who lives and serves in the Diocese of Venice. My ministry at the Church of the Good Shepherd: An Inclusive Catholic Community serves the poor of Fort Myers and surrounding areas. We feed, clothe and shoe the poor and shelter the homeless. We celebrate Mass at 2 p.m. on Sundays and serve a hot meal afterward. We also provide social and spiritual services. In reading Warner's article I wondered if I would learn about something substantial that Bishop Dewane plans to offer the poor and homeless. Their ranks have swelled in this time of national recession. This area is near the top of the list for unemployment and foreclosure, and the people are in great distress. Yet, your article is very clear that under Dewane’s administration financial assistance for the poor given through Catholic Charities has been ended and food pantries are down to being open two hours on one day a week. These facts are well known to people who turn to local churches directly for assistance. It is true that Catholics are generous givers, as are those of other faiths. I commend the work of Catholic Charities, but there is something very wrong when the finery of the church is maintained, including housing for the Bishop, when people are hungry and without shelter. The church can do better than placing a giving-tree in the Cathedral. Shame, if we cannot help empower people to attain the resources they need to live. Shame if whatever money we collect does not go to relieve the poor. There is something very wrong when Mission churches, such as St. Peter Claver, are closed when they are in the areas that serve the poorest. There is something very wrong when a Bishop claims to put the people of God foremost and funds are no longer available for them. There is something very wrong when a bishop claims no knowledge of the several firings of the educators named in the article and others, and the censure of spiritual leaders who see things differently, such as the leader of Call To Action, Ellen McNally, a former Sister. It is well known that any person or organization who supports a range of issues regarding equality and dignity for all of God’s children even indirectly, or that even listens to other views is censured by the Bishop’s office. How can he not know? The affairs of a spiritual leader’s office should be open and transparent. The buck stops with the head, the bishop. I am a validly ordained Roman Catholic Woman Priest, one of over a hundred throughout the world and the number grows steadily. Although we are not recognized by the Catholic hierarchy, we do not accept that anyone can separate us from the Church. I have remained publicly quiet until now as all of my energies must go to serving God’s people, but your article awakened me. We have served the flock that the Bishop talks about for almost three years, providing thousands of hot meals on Friday nights in Lion’s Park and now at our church by the grace of God and the generosity of people. We have shepherded 25 people from sleeping on the streets and in the woods to permanent housing. We believe that the good news to the poor includes being poor no more. We partner with Lamb of God Lutheran Episcopal Church in Estero in a blessed ecumenical effort. We have had over one hundred volunteers from various communities (Roman Catholic parishes included) assist us in these efforts, including Ellen McNally, who headed one of four teams that cooked and served meals. If her “Catholicity” is in question because she heads Call to Action, then so is Bishop Dewane’s. My soul is full of hope in this Advent season. If Bishop Dewane’s heart is moved by God’s people, then let him redirect some funds to the poor and cease his censure and oppression of all who disagree with him. Featured Musician: Jesse Lane. Jesse Lane put together the Summerland Express in 2008; a few months after producing her debut album Needless. On this program Jesse will introduce us to her second album, Vanishing Point. This album is very different from the last. Be sure to catch the songs from this very different sounding CD. Roman Catholic Women Priests and BishopsHost, Jane Blanchard, interviews Bridget Mary Meehan. Bridget Mary Meehan has fifteen years of experience in parish ministry. Irish-born Meehan is author of fifteen books including The Healing Power of Prayer (translated in seven languages) and award-winner Praying with Visionary Women. and one of the editors of three books including Women Find A Way: The Movement and Stories of Roman Catholic Womenpriests. Dr. Meehan is currently Dean of the Doctor of Ministry Program for Global Ministries University,and producer of the award-winning television program, GodTalkTV that provides programs on google and youtube on justice . 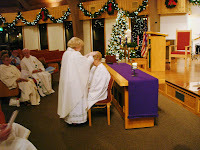 She was ordained womenpriest in 2006 and womanbishop 2009. The Irish government-sanctioned investigation found four other serving bishops and five retired bishops, including Cardinal Desmond Connell, as playing a role in the scandal cover-up lasting for decades. The Vatican has been harshly criticized in Ireland, a nation of staunch Catholic traditions, for failing to answer letters from the Dublin Archdiocese investigators. I read Dan Warner's lead article on Bishop Dewane with great interest as I am a priest who lives and serves in the Diocese of Venice. My ministry at the Church of the Good Shepherd: An Inclusive Catholic Community serves the poorest of the poor of Fort Myers and surrounding areas. We feed and clothe the poor and shelter the homeless. We celebrate Mass at 2 PM on Sundays and serve a full hot meal afterward. We also provide a full range of social and spiritual services. In reading your article I wondered if I would learn about something substantial that Bishop Dewane plans to offer the poor and homeless of this Diocese. Their needs are greater than ever and their ranks have swelled in this time of national recession. Fort Myers and Cape Coral are near the top of the list for unemployment and foreclosure and the people he claims to care for are in great pain and distress. Your article is very clear that under his administration financial assistance for the poor given through Catholic Charities has been ended and food pantries are down to being open two hours on one day a week. These facts are well known to people in need who then turn to all local churches directly for assistance as all else often fails. It is true that Catholics are generous givers, as are those of other faiths , and I commend the work of Catholic Charities but there is something very wrong when the finery of the church is maintained, including housing for the Bishop, when people are hungry, without shelter and desperate. The church can do better than a giving-tree in the Cathedral in Venice- local restaurants throughout Florida do the same. Shame, shame if we can not help empower people to attain the resources they need to live. Shame if whatever money we collect does not go to relieve the poor. There is something very wrong when Mission churches, such as St. Peter Claver, are closed when they are in the areas that serve the poorest. There is something very wrong when a Bishop claims to put the people of God foremost in his thinking and funds are no longer available for them. There is also something very wrong when a bishop claims no knowledge of the several firings of the progressive educators named in the article, and others, and the censure of spiritual leaders who see things differently, such as the leader of Call To Action, Ellen McNally, a former Sister The Mother of God House of Prayer, a Catholic Retreat House serving Catholics and the wider community was deemed "not Catholic" by the bishop. It is well known that any person or organization in the Diocese who supports women's ordination or married priests or a range of other issues of equality and dignity for all of God's children, even indirectly, or that even listens to other views is censured by the Bishop's office. How can he not know? The affairs of a spiritual leader's office should be open and transparent to all, including of course the bishop who ultimately directs his staff. In two written communications written by the Bishop Dewane in 2008, the year of my Ordination, I also was in essence deemed "not Catholic". I was warned not to proceed with Ordination with the "salvation of my soul" in question. I am a validly ordained Roman Catholic Woman Priest. Such letters are not standard for all bishops. Only some of the more than seventy validly ordained women in the United States (and over one hundred world-wide) have received such letters. We can also attest to the support of some bishops and priests, and at the very least a lack of censure. I have been told that I have separated myself from the church. I have not done so, and I do not accept his interpretation that the various ecclesial writings on women's ordination are "infallible teaching". In fact, they are simply decisions made by men that limit God's calling to males. Women were deacons, priests and bishops until the Twelfth Century. They led in the early church before the current structures developed. In Paul's letter to the Romans, Chapter 16 we hear the Apostle's praise of such women. Scholarly works demonstrating this by Gary Macy, Karen Jo Torjeson and Dorothy Irvin are available for all to read. I have remained publicly quiet until now as all of my energies go to serving God's people, but your article caused me to respond. The story about the shoes is a familiar one right here and now ,and our ministry has provided countless pairs of work boots and shoes to the poor of Fort Myers. When we run out of money to buy them new, we arrange with local Thrift Stores to provide good quality used shoes. We have served the flock that the Bishop talks about for almost three years, providing thousands of hot meals on a weekly basis as well as clothing and yes, financial aid, by the grace of God and the generosity of people of all walks of life. We have been able to shepherd twenty-five people from homelessness, from sleeping on the streets and in the woods to permanent housing. We believe that the good news to the poor includes being poor no more. We have partnered with Lamb of God Lutheran Episcopal Church in Estero in what is a blessed ecumenical effort. We have had over one hundred volunteers from various communities and churches( Roman Catholic parishes included) assist us in these efforts, including Ellen McNally, now 80, who headed one of four teams of those who cooked and served the meals for well over a year. She continues to help us and is one with the people we serve. If her "Catholicity" is in question because she heads CTA and if The Mother of God House of Prayer is not Catholic then neither are Bishop Dewane or Pope Benedict. And, in case anyone is wondering,my soul is just fine too. If Bishop Dewane's heart is moved by God's people, then let him redirect some funds to the poor and cease his censure and oppression of all who disagree with him. Host, Jane Blanchard, interviews Bridget Mary Meehan. Meehan has fifteen years of experience in parish ministry. Irish-born Meehan is author of fifteen books including The Healing Power of Prayer (translated in seven languages) and award-winner Praying with Visionary Women. and one of the editors of three books including Women Find A Way: The Movement and Stories of Roman Catholic Womenpriests. Dr. Meehan is currently Dean of the Doctor of Ministry Program for Global Ministries University,and producer of the award-winning television program, GodTalkTV that provides programs on google and youtube on justice . She was ordained womenpriest in 2006 and womanbishop 2009. This 18 December 2009 will be the 30th anniversary of the day when Pope John Paul II revoked theecclesiastical right to teach (missio canonica) of Prof. Dr. Hans Kueng because of his proposals for reform in the Catholic church. In his book ‘Infallible? An inquiry’ published in 1970 after the Second Vatican Council (1962-1965) and equally prompted by the encyclical ‘Humanae Vitae’ from 25 July 1968 Kueng raised the question if the papal ministry is indeed infallible. With this Kueng, like nobody else in our time, raised the question of truth in Christianity and kept it alive ever since. The world-famous Swiss theologian, appointed official adviser to the Second Vatican Council by Pope JohnXXIII, contributed decisively to an ecumenical theology notwithstanding his later marginalization by the church. His doctoral thesis ‘Justification’ about the Swiss reformed theologian Karl Barth, finished in 1957, was praised at the time by Joseph Ratzinger, teaching colleague of Kueng at the University of Tuebingen/Germany until 1968. Kueng made major contributions to the agreement reached in 1999 between the Catholic church and the Lutheran Church with regard to the declaration of the doctrine of justification. His ‘Project world ethos’ (www.weltethos.org) started in 1990 grew into an important stimulator for the interreligious dialogue, today more necessary than ever in the face of our global problems. On 6 October 2009 he proclaimed his ‘Declaration to a global business ethos’ in front of the UN. After the revocation of the ecclesiastical right to teach Kueng did not retract his theologically well foundedstatements to the disputed dogma of infallibility of 1870. By doing so he showed that what we are being asked to do is not to obey but to resist the usurpations from Rome. In 1979 Kueng was appointed to the chair for ecumenical theology that was created for him outside the Catholic faculty and which he occupied until 1997. In 1968 Hans Kueng drafted, together with other theologians, the declaration ‘For the freedom in theology’. In the end this text carried the signatures of 1360 theologians – also that of Joseph Ratzinger, now Pope Benedict XVI. – from all over the world. In 1989 Kueng was co-signer of the so-called ‘Cologne Declaration’, a votum for an open-minded catholicity and against an overstretching of the papal authority. Hans Kueng is also one of the spiritual supporters of the ‘KirchenVolksBegehren’ (We are Church referendum) started 1995 in Austria which resulted in the International Movement We are Church. The second volume of his memoirs ‘Controversial truth' presents a historic as well as a systematic foundation of the We are Church movement's concerns which emerged ever more clearly since the Second Vatican Council and for which he had fought already in the 1960s and 1970s. With his fundamental works (‘The Church’ 1967, ‘Being a Christian’ 1974 and ‘Does God exist?’ 1978), Kueng brought specific reform topics into public sphere early on, thoroughly justifying them both biblically and spiritually. Today we find that Kueng’s enquiries into the papacy have not been answered at all as evidenced by the increasing conflicts between the church leadership and the laity in the church. Obligatory celibacy, ordination of women and the Eucharistic question are still being discussed – despite of all the interdictions from Rome. In September 2005 Hans Kueng had a surprise meeting with Pope Benedict XVI, his former colleague at university, Professor Ratzinger. Not so surprisingly all topics regarding reforms within the Catholic church had been excluded beforehand. And as before so did Hans Kueng after the meeting commit to the reform issues important to him. Because, in the words of Hans Kueng in the second volume of his biography, ‘It is not the Council but the betrayal of the Council that led the church into crisis’. ‘His persistence in the renewal of the Roman Catholic church and his commitment to ecumenical issues as well as to the dialogue between the world religions is encouragement, inspiration and incentive for all of us’, the catholic reform movement We are Church gratefully declared on the occasion of his 80th birthday on 19 March 2008.